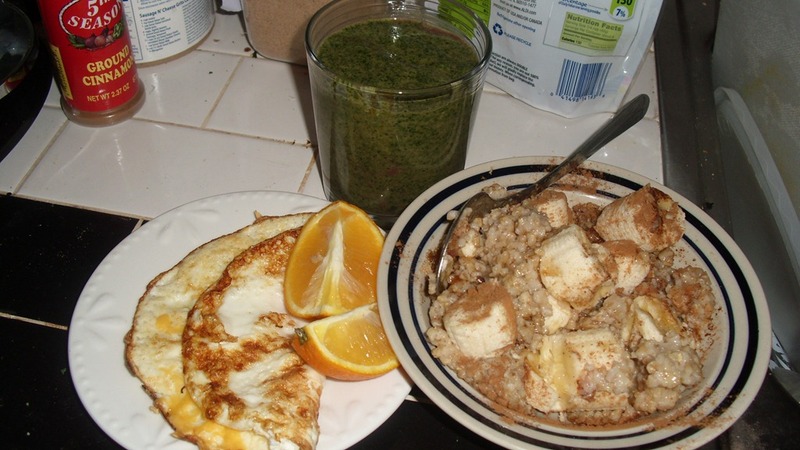 Since today is the first day of the 19 day Baha’i fast, I thought it might be interesting for you guys to see how I fuel up for breakfast on a typical fasting day. For 19 days, Baha’i’s do not eat or drink from sunrise to sunset. Since I started fasting at the age of 15, I’ve had countless people ask me questions about how I survive without eating and drinking for the majority of the day. Here’s the thing: while some days are definitely easier than others, it’s not that big of a deal to abstain from eating and drinking. Our bodies are trained to process food during certain periods of the day. However, when you think about it, the only reason we’re trained to eat three meals per day is because of worker meal plans during the Industrial Revolution. It’s actually better to eat several small meals throughout the day. Therefore, if we’re just reworking meal plans, it’s not that big of a deal to fill your body up before the day begins and then eat again at the end of the day. Of course, fasting is not encouraged if you suffer from any health ailments which affect your eating patterns (diabetes, heart disease, etc.) 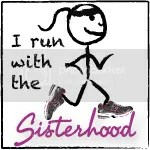 However, if you are in good physical condition (and not, you know, pregnant), you are expected to participate in the fast. Of course, the variable here is Time. I always manage to eat especially slow whenever it’s important to eat quickly. The other factor is Water. Literally, I CHUG water up until the sun rises. The pace of water consumption definitely slows down my eating. Therefore, I only managed to get down a few sips of my green monster before the sun was fully in the sky. To be honest, while I absolutely hate to waste food, I wasn’t too broken up about it- this was the first time I’ve ever put chocolate almond milk in my monster and I wasn’t a fan. It was also the first time I’ve used frozen spinach in my monster, and it was a bit too cold and the texture was off. Today is a pretty busy day- there’s a 1776 morning matinee, and I’m working in the afternoon. Tonight’s dinner will be day 3 of the macaroni and cheese bowl (Don’t worry, it’s the WW friendly day ), and I’m going to start posting recipes from the first two days of the macaroni bowl this evening. Yeah, I’m pretty excited about today. I don’t spend a lot of time talking about my religious beliefs because that’s not the purpose of this journal. However, I am very passionate about rice and proper rice cookery, and my religious beliefs play an intricate role in my rice passion. As a member of the Baha’i faith, celebrating Ayyám-i-Há is a crucial part of our calendar. The Baha’i calendar has 19 months of 19 days, and the days of Ayyám-i-Há (4 or 5 days, depending upon whether or not it’s a leap year) are intercalary days which serve to synch up the Bahai 19/19 calendar with the 365 (or 366) day solar calendar. I always explain Ayyám-i-Há as a sort of Baha’i Christmas- it’s a time of fellowship and goodwill with loved ones. However, it’s really much more than that- while gifts and gift giving are an accepted custom, they are not really the purpose of Ayyám-i-Há . In my personal life, Ayyám-i-Há is a period of preparation before I enter The Fast, which is the 19th month of the Baha’i Calendar. During The Fast, Baha’i’s do not consume any liquid or food from sun-up to sundown- it’s a period of purification, meditation, and spiritual rebirth before Naw-Ruz,literally meaning “New Year”. What better way to celebrate before a fasting period than by preparing your favorite food? Rice is a key element in Persian cuisine and, since I’m obsessed with food, Ayyám-i-Há is an excellent study of food culture and the community created by the consumption and preparation of food. Like any one who was raised in a tightknit community, I grew up with a vast yet incredibly tight and VERY diverse extended family. Just as important to me as any biological family member, my Persian “aunties” and “uncles” taught me countless lessons about the best way to properly cook Persian rice. While everyone has a different method, the universal “most important part” is the tadigh. Meaning “bottom of the pan”, tadigh is probably one of the most delicious things I’ve ever tasted- by allowing the rice to cook (uninterrupted) (low and slooooow), the oils used to cook the rice will create a delicious rice “crust” on the bottom of the pot. This crust is a freaking delicacy. Sometimes people put slices of potato underneath the rice and let those get crispy, too- with or without added extras, tadigh is buttery, delicious, and irresistible. It’s also REALLY DIFFICULT TO COOK PROPERLY. 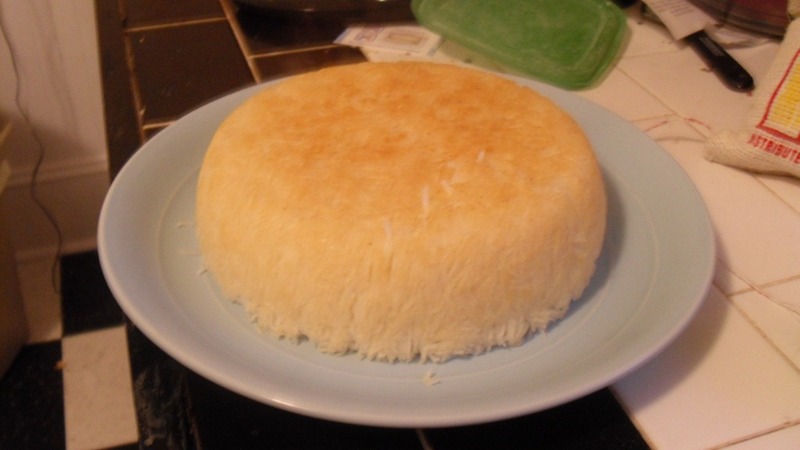 I’ve spent several years trying to properly make Persian rice with some very interesting (code for ‘disastrous’) results. 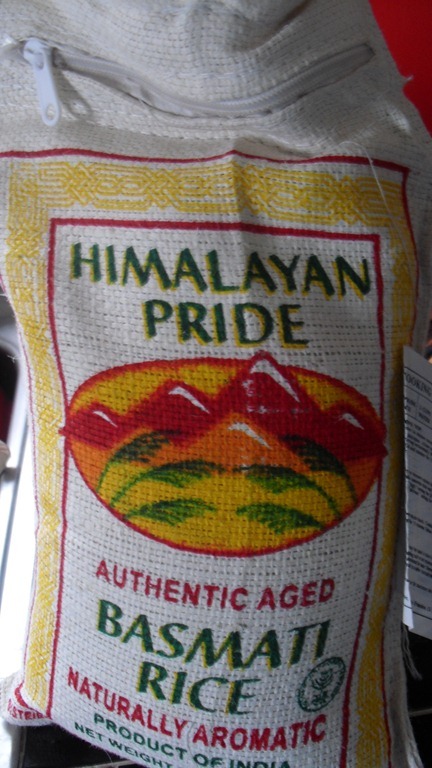 However, I’ve finally crafted a fairly fool-proof method of making pretty perfect Persian Rice. Your tadigh will turn out buttery, crunchy, and scrumptious, and each individual rice grain will leave you moaning with happiness. NOTE: All of these steps should be followed to the letter, or you will NOT have perfect Persian rice. You were warned. 1. 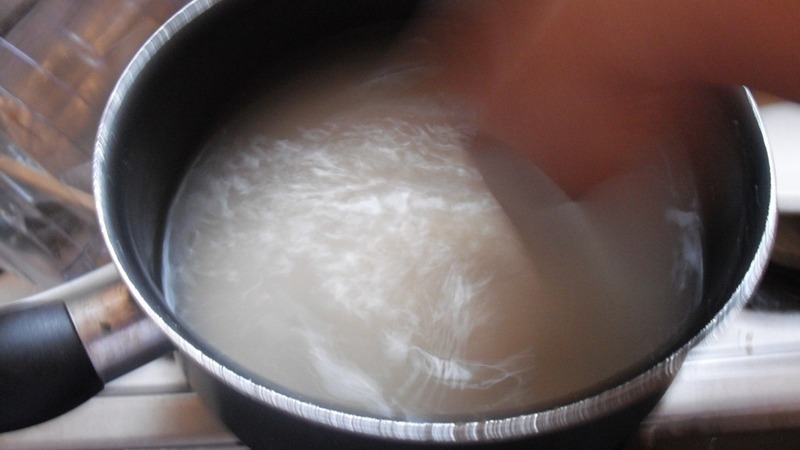 Rinse your rice thoroughly 7-8 times, until the water is clear. 2. 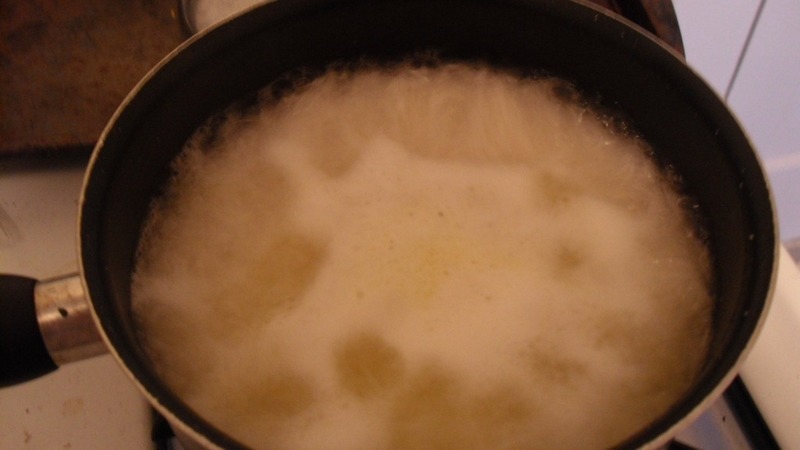 Combine your rice, water, butter, oil, and salt in your saucepan and bring to a boil, uncovered. 3. 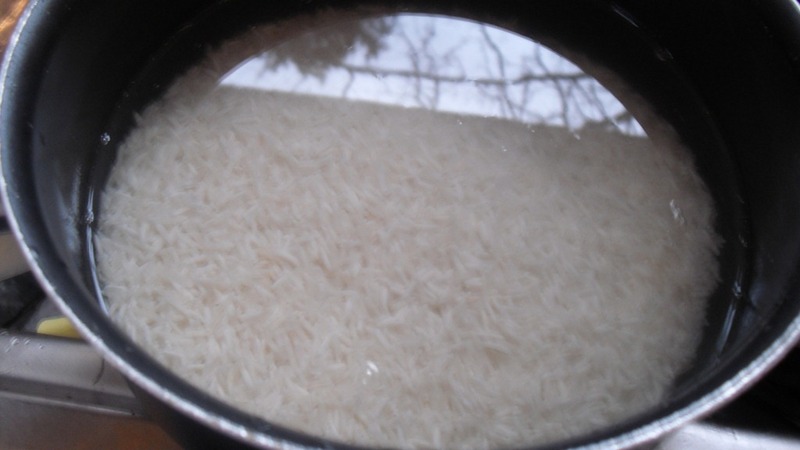 Once the rice has absorbed most of the water and the water level has reduced to just below the rice grains, reduce heat to low and cover with matching lid. 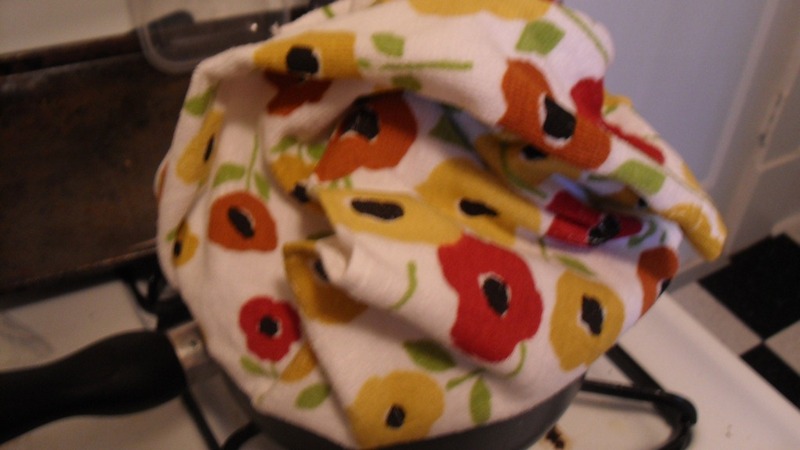 The pot lid should be wrapped in a dish towel or guarded by a paper towel. See, it’s wearing a little hat! 4. 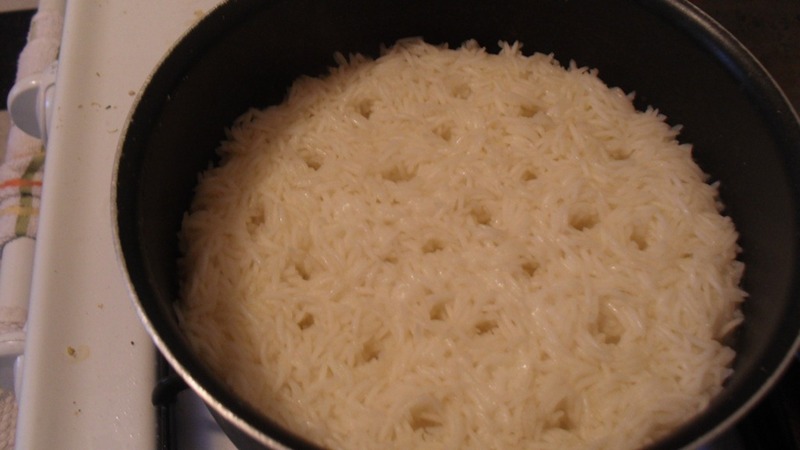 Allow rice to cook over low heat for 45 minutes. 5. Don an oven mit. Turn off stove, remove lid, and place a serving platter/dinner plate on top of the pot. Flip the pot upside down onto the serving platter and carefully shimmy it upward to release your rice. TA-DAH! Does it look like a cake? YES. The most delicious cake you’ve ever had in your life. The “pot shimmy” might take a few tries in order to master, but just keep trying- you’ll get it right. 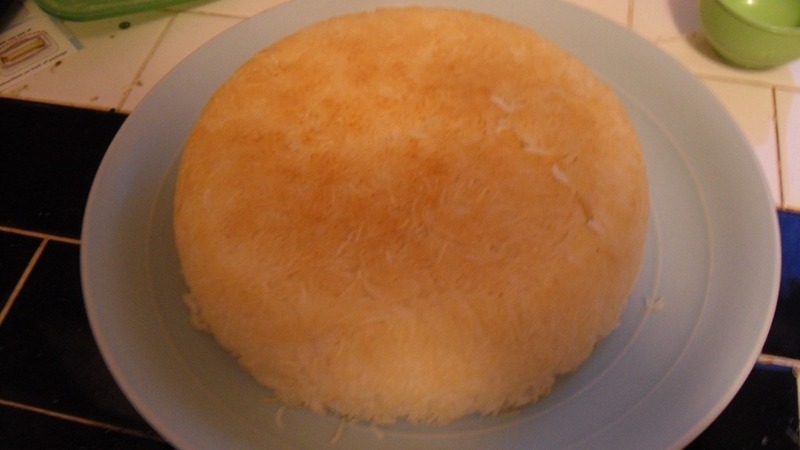 The golden crust of the tadigh surrounds the fluffy rice- I use a cake slicer to cut my tadigh and serve it in slices. You know, like a cake. 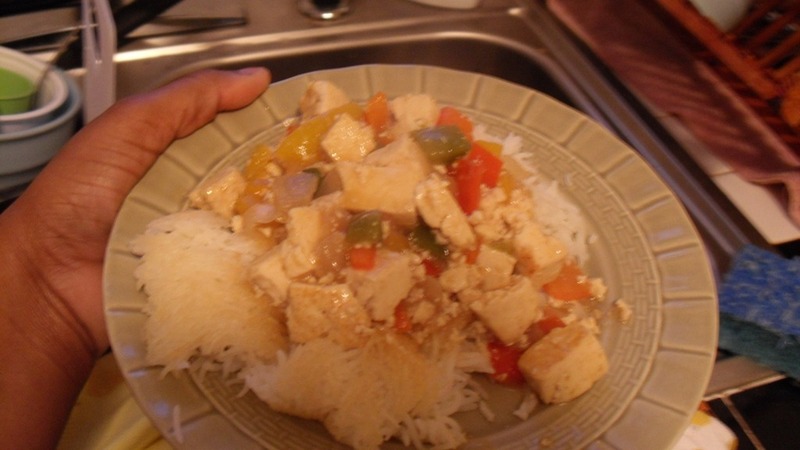 Because my lovely girlfriend can smell my Persian rice cooking from a mile away, I decided to make a simple tofu stirfry with bell peppers as the perfect match for the perfect rice.